Well that was an interesting first race, it confirmed some of my ideas and changed some of my preconceptions. Casey Stoner on the Ducati came first, Rossi's Yamaha was second, Pedrosa was third and Hopkins fourth. Then Melandri, Edwards, Vermeulen, Hayden, Barros, Nakano, Hofmann, Jacque, Roberts jnr, Elias, Guintoli and lastly Tamada. Checa, Capirossi and De Puniet crashed out. McWilliams didn't start as he could barely sit on the bike after his qualifying crash. The Ducatis are very, very fast! I don't think I've seen a bigger disparity in GPs. Rossi left the blocks convincingly and led the first lap until the final straight when for the first time the world could see the power of the new 800cc Duc. It just flew by Rossi like the Italian's bike was broken. From then on the pattern for the race was set; Casey would lead the beginning of the lap, from the home straight on. Then as the tighter part of the course came up Rossi would haul the Aussie in and sometimes pass him, then as the home straight came up again Casey would disappear into the distance. Rossi was the only rider who could stay with Casey's bike, showing Valentino's genius again. Pedrosa was with the lead pair until his team told him to turn the engine management down or risk running out of fuel, after which he slowly slid back. Hopkins got past Pedrosa when the Spaniard ran wide once but he couldn't hold him off and stayed right behind him for the rest of the race. Fantastic race for Hopkins and the Suzuki I thought. Considering Hopo's injury (right wrist) he did amazingly well. 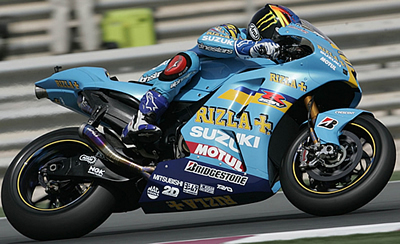 Both Suzuki's looked good throughout the race not just at beginning. I think we'll see quite a few Suzuki podiums this year and more power to 'em I say. The Honda's look fast (well Pedrosa's does) but Hayden looked lack-lustre, he's going to need to rediscover his podium consistency if he's to be in with a chance this year. I was gutted for Capirossi when he crashed (shame they had no footage of it) but Casey's speed bodes well for a good season for Capirex. Surprises? Casey Stoner! I didn't even think about him for my season predictions, I assumed he'd need a while on the Duc and a few crashes before he came good but it seems I was very wrong. If he rides like that consistently he's well in with a shot. The commentators seemed to think that the Ducatis will have to turn down their engine management on the longer tracks if they are to make their fuel go the distance and for the sake of the competition I hope they are right. In summation a good race and it was great to see Rossi using all his prodigious talent and Casey running as fast as he can without chucking it down the track. Well done Ducati and Casey Stoner! Great write up and now linked on our Blog- saved me doing all the hard stuff, like thinking. Casey Stoner. Surely there has to be more to his name. Casey Stoner Jr? Casey Stoner III its a name crying out to have something unashamedly pretentious stuck on the end. So the half a car races were good i take it? He's an Aussie I'd have thought you'd be hearing all about him in the media Keefy and yes the racing was good. Ahhh that explains a lot. They have no idea about names here. One woman has just named her poor child Pegasus and every other male rugrat is called Xavier. I dont watch Australian news programs bruh, they have never heard of unbiased reporting and attempt to sensationalise everything 'Man gets on train shocker'. Then, of course, there is the blatant advertising in the middle of the report when they ask the local business owner his thoughts on the war in Iraq and you get five minutes on peas being on special and dog food is 3 for 2. Which reminds me, when they have special offers in supermarkets here the sign is invariably as follws ' SPECIAL: Melons 2 for $5 or $2.50 each' I think they miss the point but it doesn't stop the locals from descending into a purchasing frenzy.